PCH, Upscale BMW Coupe Edition: 1967 2000C or 1984 633CSi? In another setback to French dreams of displaying the All-Time Eternal Project Car Damnation MegaTrophy (which turns into a pile of red powder within a few weeks) at the top of the Eiffel Tower, the hybridized British Leyland machine obliterated the Peugeot diesel in yesterday's Choose Your Eternity poll. The endless battle between PCH Superpowers Britain, France, and Italy will hold a cease-fire today, as we're so inspired by the beauty and coke-dealer-style original price tag of this morning's PCH car that we have no choice but to fill your garage with the sulfurous fumes of two gorgeous- yet maddeningly complex- Bavarian machines today. PCH, No Blood For Oil Edition: Veggie Oil Peugeot or Hybrid Austin Marina? Back in 1967, many of those hankering for a German performance car usually went for the Porsche 911 (priced at about $5,900) or maybe the Mercedes-Benz 250SL ($6,500). But what about the BMW 2000C, which could be purchased for a mere $5,000 and offered handling and style galore? Not many chose the BMW, which means they're quite difficult to find these days. Think you need to settle for a ho-hum 2002 for your vintage BMW project, with its easy-to-find parts and vast network of enthusiasts making your character-building Hell Project more of a laziness-inducing Mildly Challenging Project? Nein! We've managed to find this 1967 2000C (go here if the ad disappears) for you, and the price is a very reasonable $1,500! There's a big problem you'll need to solve right off the bat with this one- it's an automatic transmission-equipped car- but it "runs good." And that's all the seller sees fit to share with the world. There might be rust. There might be missing parts. The interior could be home to a boiling hive of Botswanan Urethra-Seeking Fire Millipedes. Who can say? Just imagine yourself behind the wheel of this baby after you've ditched the slushbox for a 5-speed and squeezed every last rampagin' Bavarian pony out of the engine! Those old BMWs are cool, but they just weren't expensive enough when new. 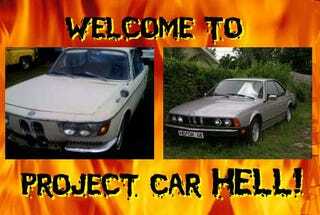 With great expense comes great complexity, and you got both in spades with the BMW E24 6-series cars. Malaise be damned, even the 70s 6-series cars were big and fast, and they looked mean. Some folks are scared off by them today, what with their rep for expensive repairs and hard-to-find parts, but we know you're willing to march right into the flames and claim your new car: this '84 BMW 633CSi (go here if the ad disappears). We hardly dare mention the price, since it must be a typo. Really, a car that sold new for the equivalent of 84 grand in 2008 dollars can't possibly be selling now for just... $800! And look at it- not in bad shape at all (well, at least the parts that you can see in the photos). Unlike the 2000C, this one comes with a manual transmission, but it's sort of on the broken side. The seller also claims it needs a fuel pump ("needs fuel pump" is often Car Seller-ese for "something maybe involving the fuel system isn't working right"). There's a certain lack of clarity surrounding its running-versus-nonrunning status, with the seller mixing past and present tense in the not-so-enlightening statement: "Yes it runs,and ran perfect." So, bad transmission, fuel system woes, "very little" rust, runs or maybe ran... there's so much to like about this car, and what a price! You should be able to get it back to showroom condition in, what, a couple of weeks? Sure!